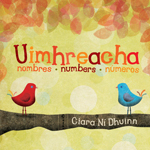 The book covers the numbers 1–10 and invites the reader to repeat the translations in Irish, English, French and Spanish. This is an excellent way to introduce young children to numbers in an engaging way. Written and illustrated by Ciara Ni Dhuinn. Conversation comes alive with beautiful textured illustrations of animals interacting with each other carefully chosen to captivate young children. 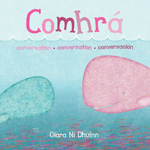 The book covers the basic conversation such as Hello, Goodbye, How are you, and invites the reader to repeat the translations in Irish, English, French and Spanish. This is an excellent way to introduce young children to basic conversation in an engaging way. Written and illustrated by Ciara Ni Dhuinn. Introduce children to the concepts of color and shape with wonderfully charming illustrations of oversized shapes and objects in different colors. The pages encourage readers to identify the shapes and colors they’ve just learned with translations in Irish, English, French and Spanish. Written and illustrated by Ciara Ni Dhuinn. Is as Ceatharlach ó dhúchas do Chiara Ní Dhuinn. Cháiligh sí mar dhearthóir i bPort Láirge agus bhog sí go Meiriceá i 2004. Tá sí pósta le Kevin Pannachia agus cónaí orthu in Illinois lena n-iníon Eliana.Smaoinigh sí ar na leabhair seo chun cuidiú le Eliana eolas a chur ar an nGaeilge agus ar a dúchas Éireannach. Tá súil aici go mbainfidh tuismitheoirí eile sásamh agus tairbhe astu chun an rud céanna a dhéanamh dá bpaistí féin. Ciara Ni Dhuinn is a native of Carlow who moved to the U.S. in 2004. She lives with her husband Kevin who is a photographer and her daughter Eliana. Ciara’s background is in graphic design and illustration, and is a graduate of design communication from WIT. 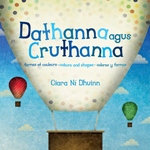 This series of children’s books came about because Ciara wanted to teach her daughter Eliana the Irish language while also teaching her about her Irish heritage. Ciara’s hope is that these language learning books will help parents in Ireland and overseas to teach and encourage the use of the Irish language from an early age. Ciara is a strong supporter of encouraging the arts at an early age as well as lending her talents to non-profit work in her spare time. Ciara landed on the shores of America in 2004 and made a home away from home in Warrenville, Illinois with her husband Kevin. After her daughter was born in 2006, Ciara a graphic designer and illustrator, began to look for children's Irish language learning books that included English translations so she could teach her daughter the Irish language while teaching her about her Irish heritage. After failing to find what she was looking for, Ciara decided to illustrate her own books the way she wanted them to be and called them "Elie's Books" after her daughter. Not long after starting this journey she joined twitter and was stumbled upon by Eoin Purcell of Green Lamp Media In Ireland. Eoin a seasoned publishing professional reached out to Ciara and eventually sent her work to a few publishing houses in Ireland he thought would be interested in her books. Sure enough someone was, and the books were picked up, submitted to Foras Na Gaelige and approved for funding as multilingual Irish language learning books. The books launched in October 2011 in Ireland during the bilingual festival in Carlow and were featured on The Late Late Toy Show by Ryan Tubridy on December 2nd.